When it's hot there's only one thing for it, ice cream! We hunt down the most glorious knickerbocker glories in the capital. Mary trained in gelato-making in Italy so this Grassmarket gem offers gelato connoisseurs the real deal. Mary uses the Flavour Thesaurus to concoct a whirlwind of fantastical flavours, from white chocolate and thyme to beer and peanuts. Inside the décor has ice-cream cone lighting and the old-fashioned white chocolate sweetie-style bar and chairs are made of recycled milk bottles. For summer they have a new picnic box selection with dandelion and burdock caramels, sourdough chocolate sandwiches and white chocolate caraway seed cakes. 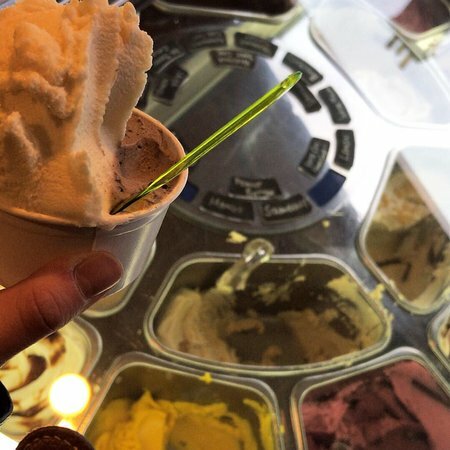 This family run, award-winning Italian ice cream parlour is an Edinburgh institution. With cafes in Musselburgh and Morningside, this is one of Edinburgh’s favourites and there’s always a queue in summer. Creations include the Raspberry Pavlova, Toffee Fudgy Wudgy and Festival Blueberry. They also serve Fisher and Donaldson pancakes, and they have a lunch and breakfast menu. This is one of the few places left where you can get a genuine Knickerbockerglory. This is a cosy and handy little coffee shop and ice cream parlour in the West End to unwind after an exhausting an shopping trip in the heat. The gelati and sorbetti are crafted on site with flavours such as the tasty dark chocolate and chilli. They also do a range of vegan ice cream. They’re open until 10pm so you can pop in for an evening treat. Probiotic ‘froyo’ is the name of the game in this healthy ice-cream alternative with less than 100 calories in the small cup. There are naughty treats too with toppings such as sticky brownies or sweet Scottish strawberries. To wash it down they serve Chinese Bubble Tea with natural tapioca pearls or jelly. There’s also Little Frisky’s which is open in August in an old police box on Rose Street. This chocolate-lover’s dream is well known for their chocolatey confections and hot chocolate but they also make delicious ice cream. Their flavours include chocolate mint, espresso amaretto and, you guessed it, chocolate. There’s also a chocolate dipped cone, a real treat. On a hot day you can take it out for a walk to the Meadows.